Dhaka, 29 July, Abnews: At least two students were crushed to death by a bus on Airport Road in Kurmitola area of the capital on Sunday. The deceased are the students of Shaheed Ramiz Uddin Cantonment School, witnesses said. However, their identity could not be known immediately. The accident took place when a Uttara-bound bus of ‘Jabal-e-Noor Paribahan’ ran over a group of students while they were standing beside the road, leaving the duo dead on the spot and at least four others injured, witnesses said. 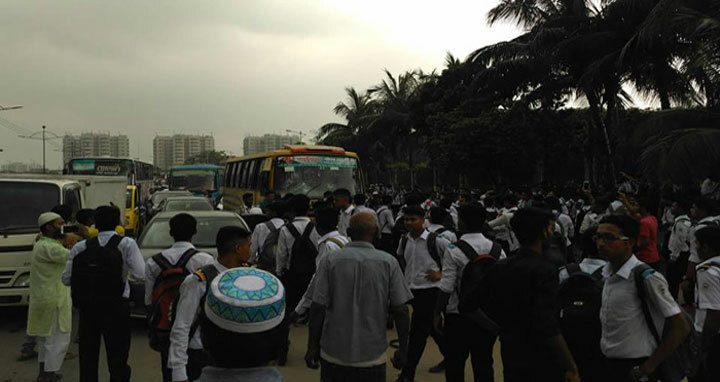 The bus coming from Mirpur area hit the standing students just after getting down from the flyover on the busy road, they added. After the accident students took to the streets in protest and vandalised several vehicles.